Partnering with educators that host our students in the schools has been a decades-old practice at the University of Wisconsin-Madison School of Education. While a key function of partnership is to prepare pre-service educators and to secure consistent, high-quality sites for clinical experiences, partnerships are established so that the School of Education plays a greater role in strengthening school communities and improving student outcomes. Ideally, there is a reciprocal flow of expertise within and between institutions, resulting in more effective teacher preparation and enhanced school improvement efforts. PK-12 educators should be integral partners in our education of educators. Partnerships promote ongoing dialogue. 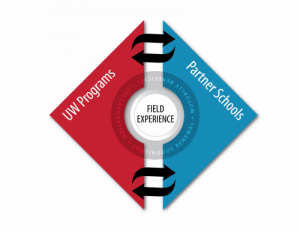 Our partnership mission is to promote the continuous renewal of both the UW-Madison educator preparation programs and the growth of educational partners by mutually investing in stronger communication, engaged research, and a recognition of respective professional contributions. With an ongoing focus on high achievement for all students, partners seek to cultivate inclusive, equitable educational sites energized by educators growing at various points along the arc of their career.